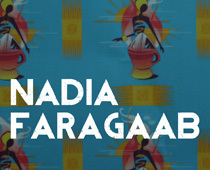 Nadia Faragaab Artist | Nadia Faragaab is a Somali Australian artist. She juxtaposes the old and new. She says that often her inspiration comes the nuances of what it means to be Somali, to her no matter where the Somali is living in the world.